WEST WARWICK, RI--(Marketwired - August 15, 2017) - For the second year in a row, Arpin Van Lines has been rated #1 among the 10 largest suppliers of household goods shipment services ranked by "customer satisfaction," according to the 23rd Annual Nationwide Relocating Employee Survey© released this month by independent research firm Trippel Survey & Research, LLC©. In May 2017, Arpin Van Lines and Arpin International Group were ranked first in supplier satisfaction by a separate Trippel survey. Arpin Van Lines earned the highest moving industry score with an 8.62 out of 10 for customer satisfaction, showing a slight improvement over its prior year score of 8.47. The company also garnered the #1 rating in "top block percentage" and "net satisfaction" scores. "Being named #1 in customer satisfaction among the 10 largest moving companies for the second year in a row is a great honor and testament to the hard work of our employees," said David Arpin, president and CEO of Arpin Van Lines. "We are still the only 'family-owned and operated' franchise-system represented in this survey and we treat our customers with the same level of care and attention as we would our own family members. That heritage and philosophy are a big part of our success." A total of 6,647 employee transferee evaluations were accumulated for this survey, which covered a range of moving industry providers including household goods shippers, relocation management companies and relocation mortgage entities. Additionally, surveyed services included corporate temporary housing, spouse-partner support and destination rentals. The 23rd Annual Nationwide Relocating Employee Survey© was conducted throughout a six-month period ending June 30, 2017. The overall purpose of this annual survey is to collect and report objective, unbiased evaluations from transferees or assignees moving within the USA regarding their level of satisfaction with external relocation service providers. The full 11-page report may be purchased from Trippel Survey & Research by calling 501-922-4000. Arpin Van Lines is an industry innovator in full-service moving and storage solutions for corporate, private residential, government and military customers with a network of over 300 affiliated agencies. Headquartered in West Warwick, Rhode Island, Arpin Van Lines is the domestic U.S. arm of Arpin Group, which also includes Arpin International Group, Creative Storage Solutions, Arpin Associates, Arpin Renewable Energy and Arpin Broadcast Network. With over 100 years of experience, Arpin Van Lines has remained owned and operated by the Arpin family, continuing the tradition and the core values of Creating Customers For Life®. It is a ProMover® member of the American Moving and Storage Association and the official mover of the LPGA. For more information, call 1-800-343-3500 or visit Arpin.com. The core business of Trippel Survey and Research, LLC© is conducting services requiring broad sampling of corporate relocation managers or service providers. The primary services Trippel provides are (1) benchmarking of company relocation polices, (2) assisting corporate managers in the selection of new service providers, (3) performance-related research on industry service providers and (4) an annual study among thousands of recently transferred transferees. For info, visit http://trippelsurvey.com. 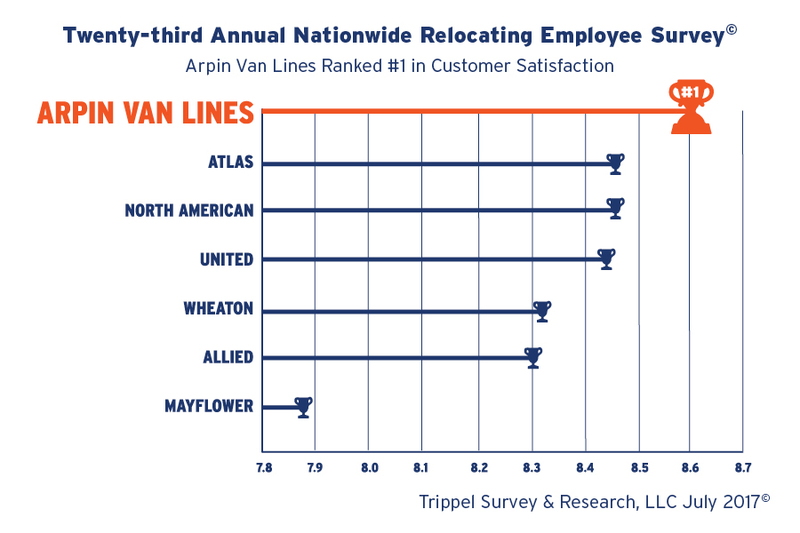 Arpin Van Lines has been rated #1 among the 10 largest suppliers of household goods shipment services ranked by "customer satisfaction," according to the 23rd Annual Nationwide Relocating Employee Survey©.